Awesome Iron rich recipe to help on your way to boost your iron levels. Boil the water in a sauce pan, remove from heat. 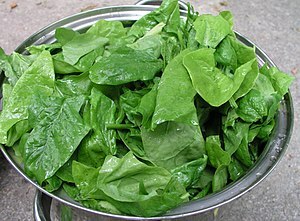 Add the spinach to the boiling water and blanch for about 30 seconds or until slightly wilted, set aside. Heat the oil in a saucepan, add the onions and sautée for about a minute. Add the tomatoes, chilli powder, salt, curry powder, crayfish and turmeric, and cook for 3 minutes (adding the crayfish gives this recipe an exotic African twist). Add the spinach into the mixture, mix properly and cook for about a minute. Serve with either grilled fish or chicken. Yum yum. You can get the crayfish from most African stores and in some supermarkets but remember, it’s optional!